WAXIE Sanitary Supply carries its own line of equipment such as WAXIE commercial vacuums, WAXIE extractors, WAXIE floor scrubbers, WAXIE floor machines and specialty WAXIE cleaning machines for your home, office or industrial space! WAXIE also can service and repair your used WAXIE equipment. 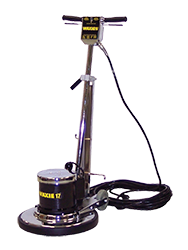 The WAXIE 17" 1-HP Floor Machine operates at 175-RPM. 1-HP, 66-frame motor features a straight line planetary gear system, assuring efficient transfer of power from the motor to the brush. 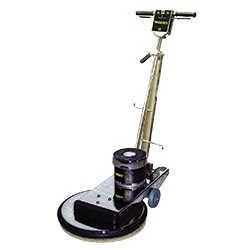 The WAXIE 17" floor machine is shipped in two pieces. The handle and base can be easily assembled in minutes by sliding the two halves together and installing five bolts. The handle assembly has a convenient storage peg for the pad driver or brush assembly. Ideal for schools, hospitals and office buildings for stripping, spray buffing, polishing and bonnet cleaning. Item#571028 Click here to view more floor machines.